Miss Hope Henderson Paton was the daughter of John Middleton Paton who, along with his brother George, had founded Chapel Works (Paton’s Mill). Her grandfather, the Rev. Dr. Paton, had been for many years the minister of Craig Parish Church. Her family were among the founding members of St. John’s Church and she was for many years the Collector of the Sustenance Fund. Hope Paton was extremely well known to Montrosians for supporting the local charities of her era and in 1902 she intimated to the Town Council an offer of financial help in setting out a bowling green as a further extension of the Mid Links. The area selected was described as being a pretty green area with a narrow footpath crossing diagonally from the foot of John Street to the top of Wellington Street. Bowling was popular at that time and the success of the Melville bowling green, which had opened in 1878, made another public green a virtual necessity. With help from other members of her family the amount donated eventually reached the considerable sum for those days of nearly £1,000. 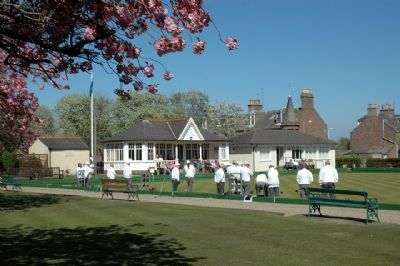 At a meeting of the Town Council in March 1904 the Provost said that Miss Paton was entitled to the whole credit for the laying out of the park and bowling green and that the area should be known as the Hope Paton Gardens. Hope Paton died in June 1908 at the age of 89, having spent most of her life in the house built by her father, now the Links Hotel. We as present members of the Hope Paton Bowling Club are entrusted with ensuring that the memory of Miss Hope Henderson Paton lives on through our club on this site. Why don't you find out more about the club by searching our site!